Antibacterial, stimulating and detoxifying. 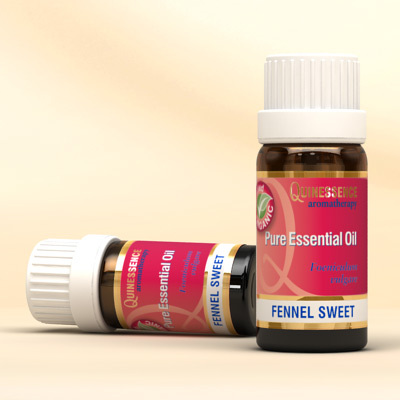 Organic Sweet Fennel Essential Oil is the ideal oil for treating cellulite, especially when it is used with juniper berry and cypress in massage blends. It has a powerful stimulating and cleansing action that tones the liver, spleen and kidneys, helping to detoxify and re-energize. Fennel Essential Oil can be used as an appetite suppressant when used with weight-loss programs. Distilled from the dried and crushed seeds of the herb, Organic Sweet Fennel Oil has an aniseed-like aroma, with slightly peppery and earthy back-notes reminiscent of liquorice. It stimulates the digestive, excretory and nervous systems which is why the herb has been used for thousands of years for digestive disorders. It also makes a refreshing mouthwash. Organic Sweet Fennel Essential Oil provides a stimulating and toning effect on skin that can revive dull, tired and mature complexions. The oil was shown in research to have antioxidant properties and was effective at killing several different types of bacteria and fungi in a study published in the February 2011 journal ‘Molecules’.